→Cardamom is a Spicy Superfood! Cardamom is a Spicy Superfood! Add some spice to your diet with superfood Cardamom! Did you know cardamom is a natural treatment for the H. pylori bacteria associate with ulcers? Even if you don’t have ulcers, it’s good for a calming effect on the digestive tract. It’s helpful for gastritis or any sort of upset stomach. Not only that, but cardamom has lots of essential oils with high antioxidant properties, and a good food to fight inflammation in the body. Native to the evergreen forests of India, Cardamom was probably taken to Europe about 800 years ago, and from there spread throughout the rest of the world. It is grown mostly in India, but Guatemala, Mexico and Thailand also grow and export this spice. It is a member of the ginger family, and has a strong, unique taste. It also has an intensely aromatic fragrance. Elettaria, or green or true cardamom. Considered the finest and most aromatic of the three types. It’s used in sweet and savory dishes throughout India. White cardamom is merely green pods that have been bleached to use in such things as light-colored breads and batters. 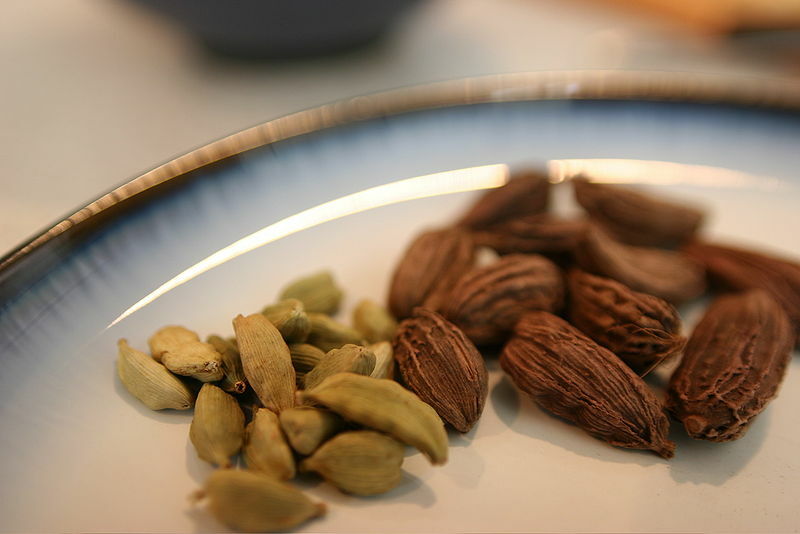 Bleaching diminishes some of the flavor, so avoid white cardamom unless a uniform light color is needed. Amomum, or black cardamom. It has a distinctly smoky aroma with a strong flavor, kind of medicinal. It is found in savory dishes in India, Morocco, and China. Aframomum corrorima, also known as korarima, Ethiopian cardamom, or false cardamom, used in Africa and Madagascar in spice mixtures and to flavor coffee. Most recipes call for green, or true cardamom, or in baked goods the bleached variety, white cardamom. One of the most frequent uses of cardamom is in baking breads and muffins, and also for beverages. It can also be found in recipes for such things as curries, masala, meat loaf and sausages. You can buy cardamom fresh in the pod or in the ground form. If you’re not going to use it fairly quickly, it’s best stored in the pod form, as once it is ground it loses flavor fairly fast. Ground cardamom is a nice addition to oatmeal or other hot breakfast cereals. It’s also nice in rice pudding. Whole cardamom can be added to teas or chai beverages. Here’s a sample recipe that uses cardamom, along with links to some other healthy cardamom recipes. Mix dry ingredients in one bowl and wet ingredients in another. Combine wet and dry ingredients, then fold in blueberries. Pour into six muffin cups and bake at 350°F for 25 minutes. Check out this list of superfoods at 111 Healthy Food Choices! Add a little spice to your life by using the superfood cardamom in your diet. High in antioxidants, it fights inflammation and is good for your digestive tract.